How awesome are the Pinnacles? I know, it’s quite a contrast to the beautiful lush green rice fields surrounding us here. But I thought I’d put in a bit of a flashback to a recent visit because we’re linking up with Four Around the World’s Snapshot Story. We were in Perth for a month visiting my family and my uncle and aunt from the UK in March, before moving to Cambodia and we did a day trip to the Pinnacles with them. It’s such a great place to take visitors. And this trip was really special because it was 11 years since I’d last seen my Uncle Vic and 19 years since I saw my Aunty Jan. The tyranny of distance can create great gaps in family relationships and it was wonderful to spend the time together and reconnect. I’ve been fascinated with these ancient limestone formations for many years. 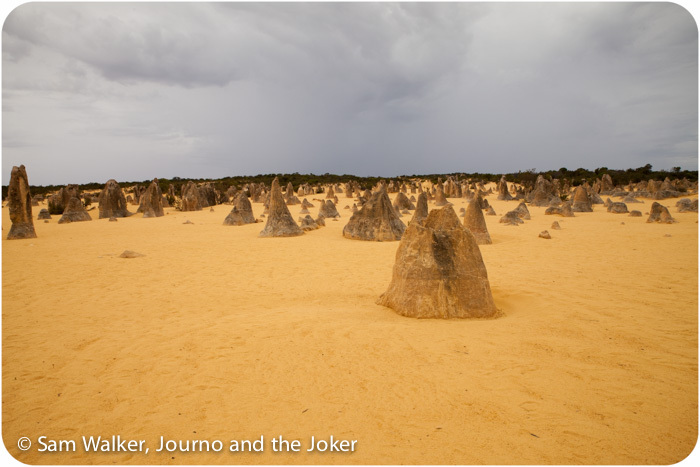 The Pinnacles Desert is situated in the Nambung National Park, about 160 kilometres north of Perth in Western Australia. I’ve visited on numerous occasions but usually the backdrop was a vivid blue sky and sometimes scorching temperatures of around 50 degrees Celsius in the sun. The clouds added a new, more dramatic mood. It’s hard to believe this harsh landscape is a short distance to beautiful white beaches and the Indian Ocean. Thanks to Holly for the opportunity to link up with Four Around the World’s Snapshot Story. Head on over and check out some of the other posts and interesting stories. Have you ever visited the Pinnacles? Or got a cool snapshot you want to share? We’d love to hear your experience. My parents took my sisters and I to the Pinnales when I was a child. We have some family photos of us sitting all over them. (Not allowed to do that now:) ). Yes, Sally my first memory of the Pinnacles is when I was about three or four. And you could walk anywhere and climb on them. You still have very good access now I think. 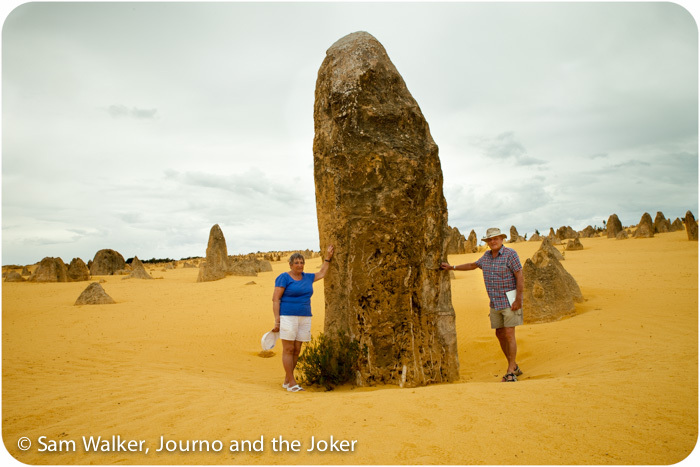 Do you know, I grew up in WA…but have never been to the Pinnacles! I think that needs to be rectified. Oh my goodness Fairlie, that definitely needs to be rectified! If you have the opportunity I would recommend spring because all the wildflowers will be out in the national park surrounding the Pinnacles. And I recommend avoiding summer if possible. Went in late February some years back and it was so hot you could barely walk around. It was like an oven. Thank you so much Fabiola. That is really unexpected and I’m honoured. Will take me a little while to get around to answering but I accept! I remember going to the Pinnacles as a 19 year old. And from memory there are sand dunes nearby? Not sure but I remember a daytrip to the Pinnacles and sand dunes and then the ocean was nearby. Hi Lyndall. Glad you enjoyed it. It’s a great place to visit and an easy day trip from Perth. Hope you get to see it one day. I’m embarrassed. I didn’t know the Pinnacles existed. But, the blog pics were absolutely amazing! Incredibly beautiful. The picture of you standing next to it gives great perspective. Thanks! I’m subbing. Love your blog! Glad it’s inspired you to visit Katie. Hope you get there! Thanks for your kind words Claire. It is such a unique landscape I think people are fascinated by it. Incredibly beautiful! Wow what adventures you all have. I am married to a homebody and I have always been one to make memories with the kids. Really extraordinary landscape. Hi V. Yes, it is an incredible landscape. It’s one of the things I love about it. And the different weather gives it different moods. Keep making memories! The photos are beautiful. 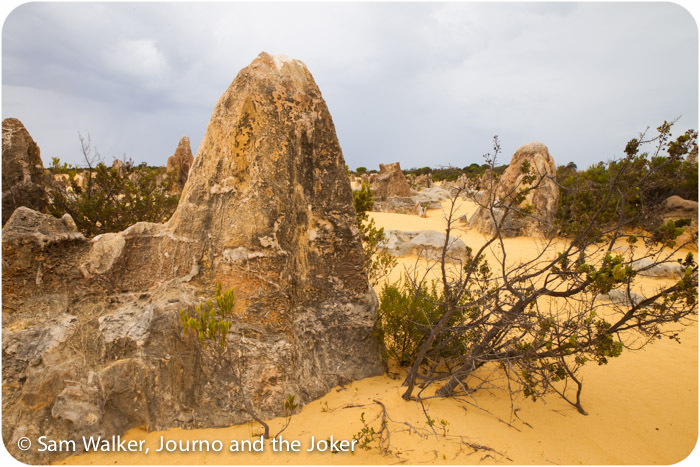 Haven’t been to WA yet but it’s on the bucket list and will definitely visit the Pinnacles then. Thanks Tamuria. You will love the west coast. Some of the best beaches you will come across and some amazing things to do and see. Hope you get there one day soon. You are welcome Holly. I love the opportunity that you provide with your linkup. Oh wow, you will love WA if you have never been before. More rugged than much of the east but beautiful beaches. Hope you get there.